The Starry Expanse Team would like to congratulate Cyan on the conclusion of their Kickstarter. Well done to all who contributed to make it such a success. What a result! It’s been a very busy month for us here at the project. We’ve made significant headway on multiple fronts, from several innovations in our development pipeline and review system, to the creation of dozens of new assets and the recent establishment of an exciting new project that we can’t talk about yet (but we promise you’ll love it). 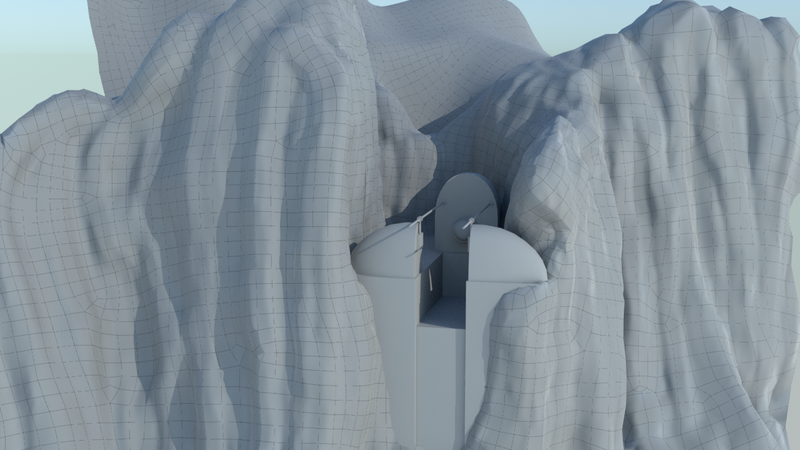 Recent developments in our camera matching pipeline have allowed us to speed up the creation process of one of the trickier aspects of recreating Riven in realtime – the terrain. Here is a video that shows off some of the work our camera matching specialist, Stuart Attenborrow, has been carving away at recently. If you’re a member of our Discord server, you may already have seen some glimpses of this – the latest iteration of Boiler Island’s crater in all its glory. This month we also had the addition of five (yes, five!) new team members into the Starry Expanse family. Please make them feel welcome! It’s the 25th Anniversary of Myst and (as we’re sure many of you already know) Cyan is celebrating in style. The #Myst25 Kickstarter has been live for less than two weeks and as of this writing they have met their goal more than five times over (almost six! ), and they’re not even halfway through! We’d like to take this opportunity to thank Cyan for all their hard work, not just in the creation of some of the most unforgettable experiences in gaming history, but also for their recent endeavours to safeguard those experiences for all of us to enjoy. We appreciate all that they do, and although they need no help from us, we’d like to do our part to spread the word. It goes without saying that our project (and the wonderful fans who support us) would not exist without Cyan, and we’re just as excited as you for a chance to support this latest release – which includes some very cool Riven-themed rewards. If you haven’t already, head on over to the Kickstarter page and show them your support. There are also some community challenges that you can take part in, even if you’re not able to pledge. In unrelated news, we’d also like to invite you to join the official Starry Expanse Project Discord server. If you’re not familiar, Discord is a popular communication tool for gaming communities, and hosts both voice and text messaging services. If you’re interested in discussions of all things Myst, debates on the finer points of D’ni literacy, awful, awful puns, or would just like an opportunity to speak directly to members of the Starry Expanse team – we’d love to see you there! Hello everyone. My name’s Stuart Attenborrow, and welcome to the semi-regular update on camera matching! This topic has been covered extensively in the past so I’ll try not to repeat what you already know. However, for those that are new to the project: camera matching is a term we use to describe a range of techniques that all involve using the original in-game stills to position objects in 3D space. We do this to ensure we preserve the scale, position and shape of every element in the game, and it is the most time consuming part of the process. Unfortunately it’s also the first stage of the process, thus creating an immediate bottleneck when we start work on a new area. Luckily, this year has seen a fundamental shift in the way we’re approaching camera matching. If we were to continue matching each frame by hand, the project would likely never see the light of day. And so we’ve changed tack. Again. A few of our supporters have offered great suggestions regarding ways of automating the process, including a topic known as photogrammetry. This involves taking lots of photos of an object and using software to generate a 3D model complete with textures. 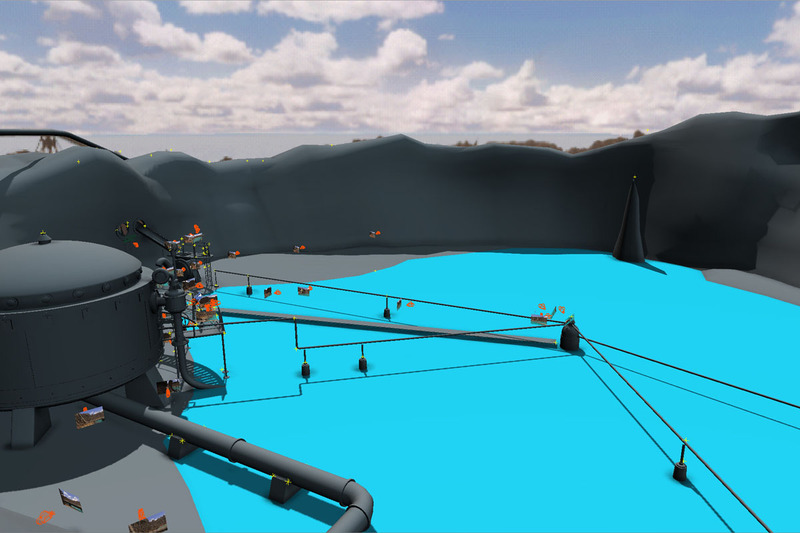 Some examples of commercial software that can achieve this task include: Autodesk ReMake, Agisoft PhotoScan, Reality Capture, or something a bit more obscure like VisualSFM. It’s never as easy as it sounds. The biggest problem we have with automating the matching process is that it requires a lot of source imagery to work. Riven might seem like it has a lot of images, but most of the time they’re too far apart, too dark, too compressed, or just plain too small to be of any use. Another small but not insignificant issue is that some areas in the game defy the laws of physics. An interior may end up being larger than is physically possible from its exterior. This leaves us with a couple of options. Either we announce the end of Starry Expanse and our crushing defeat in the face of insurmountable odds, or we put our thinking caps on. We preferred the latter. To explain what we’re doing now, let’s first go over a brief explanation of what photogrammetry is all about. There are many stages to a photogrammetry pipeline. The first is feature detection, where contrasty or unique shapes are determined in each image. The second is feature matching, where each image is compared to every other image to determine common features. Next is the sparse reconstruction stage, where 2D becomes 3D. 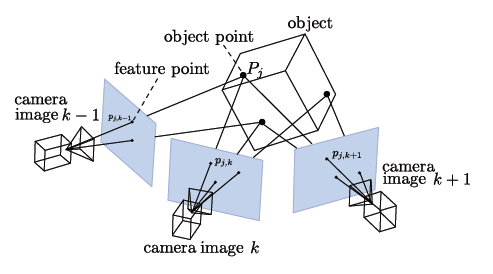 This results in a number of points in 3D space representing the subject, and a number of camera positions that represent where each image was taken. Assuming each stage completed successfully, a final stage can be performed where the sparse reconstruction is used to generate a dense point cloud of the subject. In short, there’s a ton of math involved, created by some very intelligent people (thanks everyone!). The images in Riven usually fall down at the sparse reconstruction stage. There aren’t enough matching features found in enough different images for an automated photogrammetry pipeline to rebuild the 3D scene to a good standard (or at all). To solve this issue, we’re manually performing the feature detection and matching stages ourselves. Whilst there are a lot less matching features between images, the quality of the matches are far better. This means the reconstruction stage is successful, we get a 3D scene of a few key points, and most importantly all of the original camera positions! It sounds like a lot of work (and it still is), but it’s an order of magnitude less work than the previous method. Plus it results in a much more accurate outcome. At this point we block out the scene using a simple mesh (you may be familiar with the greyscale landscapes we’ve shared previously). We use the key points as guides, and each camera to align the geometry. This can be handed off to the modelers to create the final assets. My involvement so far has focused on matching the full motion videos. On the upside, there’s a lot of frames in each video to match, but on the downside the videos are heavily compressed. For the following maglev ride I’ve had to match both directions and merge the result to ensure the location of the supports and docks are accurate. In addition to this, I’ve been working on a way of incorporating a dense point cloud reconstruction process into our pipeline. Since we’re manually matching the images we haven’t been able to use the same methods employed by the software mentioned above. Preliminary results are very promising. This makes the blockout process semi-automated and greatly reduces the time spent creating the initial geometry. Plus we get textured meshes from the match! To put this task in perspective I’ve put together a little graph. I think the results speak for themselves. With the camera matching process taking a huge leap forward, our modeling team won’t know what hit them. Expect more great things to come. If you’d like to hear more about what we’re doing, have any questions for us, or if you just feel like a chat, head on over to our new discord server! Finally, a big welcome to our newest member Cameron Craig, who’ll be assisting with the creation of our all-important characters. Hello everyone! Hollister the audio guy here. Happy Easter! As many of you know, the question of how to handle the audio in our game has been a hot topic within the team. We’ve gone back and forth about whether or not we want to just use the original audio, or if we should perhaps see about recreating it, as we are doing with the models. The cutscenes are a great example of this. We could just use the original audio, but since we’re creating new character animations, the old audio, aside from being considerably low-quality, wouldn’t line up perfectly with the new animations. So, this has been a point of contention within the team for a while, as everyone has different opinions on it. Luckily, I’m a very driven person, so I took the initiative and went ahead and used your incredibly generous donations to hire some equally incredible voice over talent. I haven’t talked to the team about this yet, but I’m completely sure they’ll be on-board. Now, onto the good stuff! We’ve already recorded some of the cutscenes, and I’m eager to showcase them. I hope you enjoyed this presentation. Stay tuned for more audio updates! 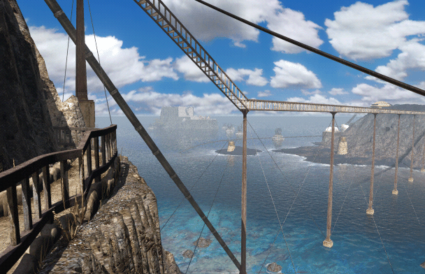 I’m so happy to be such a big part of bringing Myst 2 to life! Happy belated New Year from The Starry Expanse Project! It’s been a while since our last update, but don’t let that fool you into thinking we’ve just been sitting idle. Over the holiday break we took the opportunity of the downtime to critically review our pipeline, and get all our ducks in a row to be as productive as possible in the new year. We’ve restructured our team to be more autonomous and efficient, and we’ve been hard at work on camera matching. We can’t wait to share more of our plans for 2018, but until then here is some work in progress from our artists Leonard Schölch and Nick Mower (hey, that’s me!). It’s Boiler Island’s namesake – The Boiler! 2018 is going to be a huge year for us, in more ways than one. We’ve got plenty of surprises in store. Stay tuned! Welcome to our newest team member, Stuart Attenborrow – a multi talented software developer. Whether you’ve been following us for some time or just discovered us recently, it’s no secret that reproducing the environments of Riven in a modern game engine is a considerable undertaking, and of all those tasks, terrain is by far the most time consuming. Historically we have avoided committing too much development time to terrain because in many ways it is secondary, and just wraps around more important features of the environment. Our priorities have always been to first block-in the navigable areas and interactable objects, followed by large set dressing, and only after that was complete would we start on terrain. 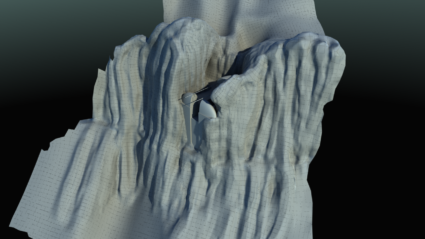 We’re now at a stage in the project where large parts of the game are ready for a detail pass, and so our intrepid 3D artist Jonas Becsan has been hard at work sculpting out the terrain on what is inarguably the most challenging location in the game – Jungle Island! We’re eager to share more of our workflow with you, so stay tuned for a more technical breakdown of our process early next year. Stay tuned! On this day, twenty years ago, to much anticipation, Riven: The Sequel to Myst was finally released to worldwide critical acclaim. Two decades later, our project to remake this game has become a symbol of how much it means to all of us on the Starry Expanse team. 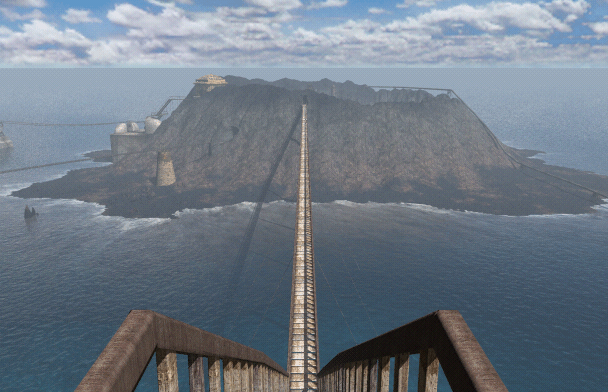 Riven was the high-water mark of the Myst series. Twenty years of adventure gaming, puzzle solving, and online community discussion… Now, here we are, at the tail end of 2017. So much of the game development and computer graphics industries has changed in the twenty years since 1997, but we are honored that someday we will be able to bring this amazing experience to new players in order to continue its legacy. Please note that these panoramic images are a work in progress and do not represent the final position of navigation nodes in realRiven, and neither do they reflect the final quality of the game. They are the result of our experimentation with Unreal’s stereoscopic capture feature, and while they are areas you have likely seen before if you are a regular reader of this blog, we are excited to have been provided a new way to show our environments, which seems fitting for the occasion. We’d like to extend a big thank you to all who have contributed to our navigation design discussion over the last month, whether it was here on the blog or on social media. We were blown away by the response, and it was fantastic to see the ongoing positive discussion and constructive criticism within the Myst community. 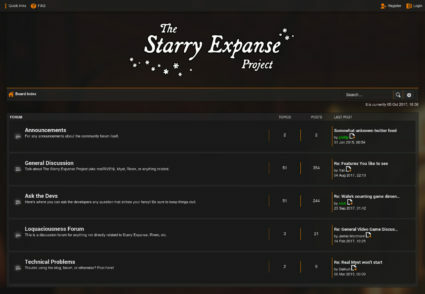 In the past we’ve been hesitant to publicly discuss some of these challenges, but the response was so gratifying that we have taken some time to update both the forum and our subreddit /r/StarryExpanse (previously gathering dust this last year and more) to help facilitate more communication between the team and those who are following the project. The new look of our community forum, be sure to stop by and say hi! We hope to discuss more design considerations with you soon, and if you’ve not had a chance to tell us what you think of our plans for the Boiler Bridge, there is still time to join the conversation here, on our forums, subreddit, Facebook or Twitter. We’re all over the place! 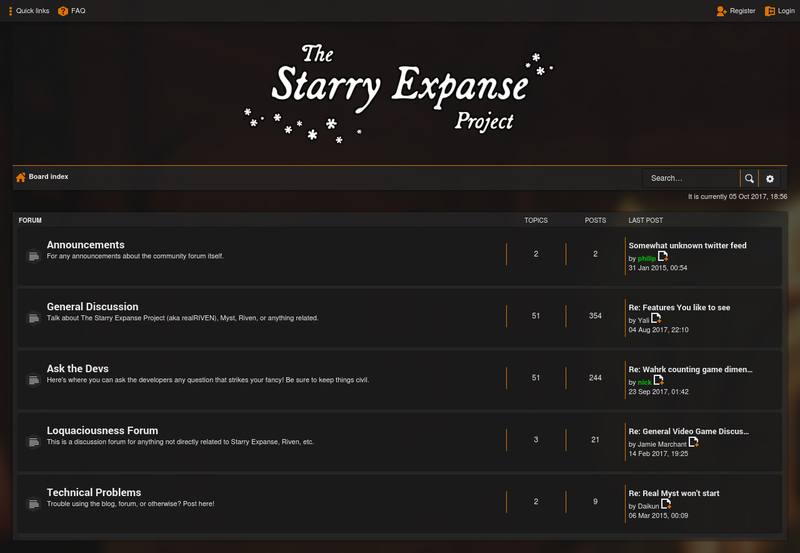 The new and improved /r/StarryExpanse, created by Hollister Starrett. Mysterium, the annual convention for all things Myst, is upon us once again. As is traditional, we’ve been hard at work preparing a demonstration that showcases some of the things we’ve worked on throughout the year. (Updated) Our presentation occurred on Saturday, August 5th at 4pm EST.